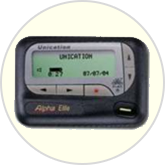 The Unication Pager is a four line alphanumeric pager that is virtually identical to its Motorola counterpart. It is gaining popularity due to its ease of use; It is capable of displaying 4 lines of text with 20 alphabetic characters on each line. The date and time are also displayed on the screen, along with a built in alarm clock. A reminder alert lets you know that there are still unread messages. Users can set the alerts manually as per their requirements, like vibrating alert, standard alert, no alert or silent mode, chirping alert and 7 types of various other alert sounds. An added feature is the out of range alert to signal when the pager will not work due to range issues. The battery indicator helps to inform you of the status of battery, along with a memory full indicator to help prevent accidental erasure of important messages. The pager continues to save your messages while changing the batteries or when the pager is off. The important messages can be saved and deleted as per the user’s needs. The Unication models are popular replacements for the now discontinued Motorola Advisor Gold and Advisor Elite models since they operate identically.